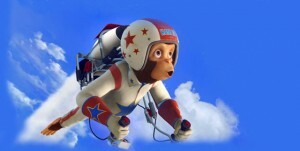 20th Century Fox Home Entertainment sent chimps back to space in the animated family movie Space Chimps 2: Zartog Strikes Back, released on DVD on Oct. 5, 2010. The sequel to the 2008 animated film, Space Chimps 2 follows Comet, who’s usually left at mission control but longs to go to space like his chimp friends. Comet gets the chance to travel to space and meet Kilowatt, a once shy alien. But when the evil alien ruler Zartog takes over mission control, Comet must join his fellow space chimps to save the day. The PG- rated movie features the voices of actors Jane Lynch (TV’s Glee), Cheryl Hines (TV’s Curb Your Enthusiasm), Stanley Tucci (Julie and Julia) and Patrick Warburton (TV’s Rules of Engagement). 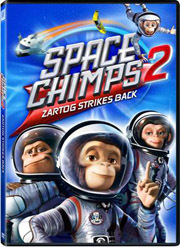 Produced by Vanguard Animation, Space Chimps 2: Zartog Strikes Back was released in separate 2D and 3D versions priced at $22.98 and a two-pack including both the original Space Chimps and Space Chimps 2 3D priced at $34.98. The 3D and two-pack versions include four pairs of red/blue 3D glasses. The movie was released in theaters in the United Kingdom, but in the U.S., its premiere was this DVD.